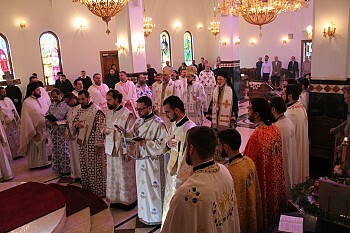 Following a continental breakfast the clergy and participants of the Institute reassembled in the meeting hall where Bishop Irinej introduced guest speaker Fr. John Behr. Fr. 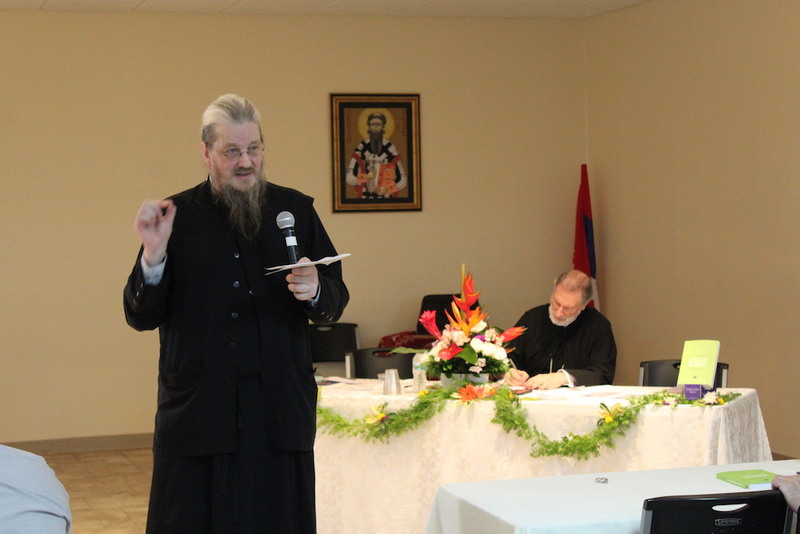 John is Dean, Rector, Director of the Masters of Theology Program and Professor of Patristics at St. Vladimir's Seminary in Yonkers, New York. In his talk, entitled “Creation and Becoming Human: Protological or Eschatological?“, he spoke of the need to read Scripture as Scripture. Just as Moses is described as having a veil over his face when speaking to the people to shroud the glory of the Lord, all of Scripture is veiled, hidden, until the coming of Christ, more specifically until His Cross and Resurrection. This unveiling or revealing is oftentimes described in Scripture as being an “apocalypse“ which means, a revelation. When St. Paul writes to the Romans he refers to this when he says, “to him who is able to strengthen you, according to the apocalypse of the mystery which was kept secret for long ages....“ (16:25-27). God the Father is the one who reveals – uveils the mystery - to St. Peter, allowing him to confess that Christ is the Son of the living God. All the Apostles, and in fact the whole world, will be able to know this after the Lord's Passion and Resurrection that's why the Lord calls Peter Satan after he tells the Lord he doesn't want Him to go to his suffering. Anyone who places themselves between Christ and the Cross is the enemy, satan. The reading of scripture, therefore, is cryptic: it is unveiled; it is harmonious: it speaks about Christ from beginning to end; it is contemporary: that's why Christ will say “Moses spoke about Me...“, in other words what Scriptures talks about is not merely historical but in the here and now; and it is inspiring not in a modern sense of the word that we are “inspired however we read it“ but rather it was the prophets and apostles who were inspired by the Holy Spirit.